To mark the School’s 50th year, an anniversary book was commissioned by the School, Unicorn (PTA), and the Elders’ Association, who played an important role in the book’s development by providing school day recollections, newspaper clippings and photographs. The video below celebrates the printing of the book, and the photos below show snippets. The book is priced at £20 + postage & packaging. 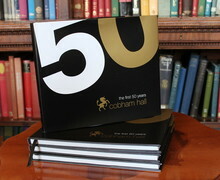 If you would like to order a copy, please email Mrs Julia Booth via boothj@cobhamhall.com.